Hank LoForte failed to get on base Saturday vs. Long Beach State, snapping his 64 game on-base streak dating back to March 11, 2018. They say all good things must come to an end. Unfortunately Hank LoForte‘s amazing on-base streak ended on Saturday night at Blair Field in Long Beach. LoForte ended the night with 5 at-bats and struck out three times. The other two at-bats included a line out to right field to end the second and a fly out to center in the fourth. Despite the streak ending, the Titans did get the win and clinched the series win. 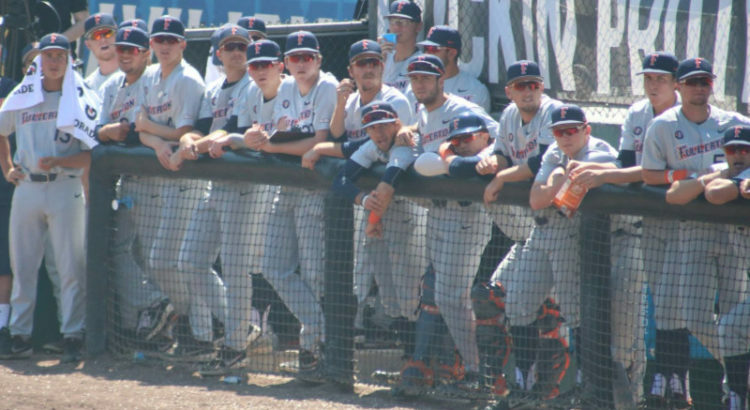 Although it was disappointing to see the streak end, it did gain some social media attention from national college baseball writers in the process. LoForte followed up losing the on-base streak on Saturday with a 2-for-4 performance, scoring a run and reaching base via walk on Sunday. LoForte carries his one game hitting streak into tonight’s game with Pepperdine looking to start another streak. 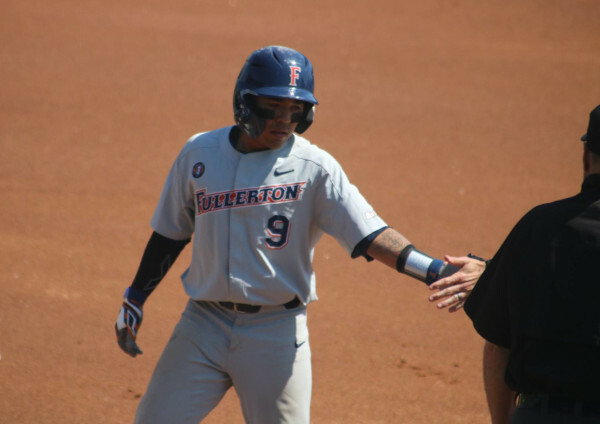 Titans completed a three-game sweep of Long Beach State at Blair field on Sunday. Titans broke out the brooms on Sunday and completed the first sweep of the season with a 5-1 victory over Long Beach State. The last time the Titans swept the Dirtbags was in 2015 and this sweep was the first time at Blair Field since 2013. Although sweeping the Dirtbags is always nice because, well, they’re the Dirtbags… this sweep could provide the much needed confidence the Titans need headed into conference play this weekend. The confidence and enthusiasm should be tempered because the Dirtbags are not playing very well this season. With a 3-19 record, the Dirtbags have played six series already and have been swept four times. Anytime you can beat your longtime rival, whether it is an up or down year for them, it is sweet. 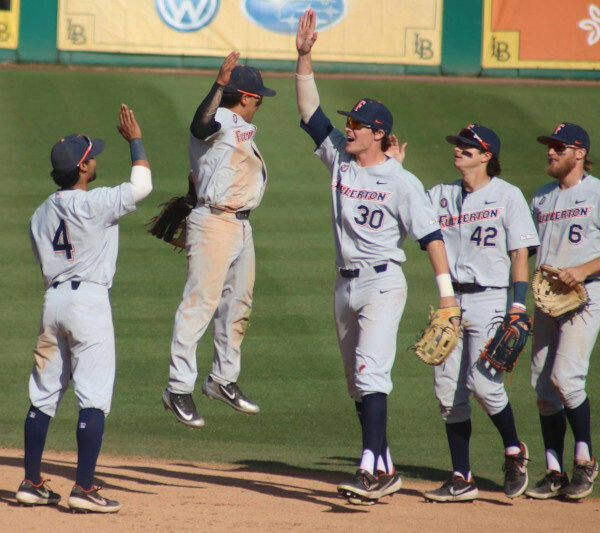 The Titans need to take that winning streak momentum and channel it into this week with Pepperdine and UC Santa Barbara coming to Goodwin Field. Brett Borgogno looks to get more playing time if Zach Lew’s injury persists. Add two more Titans to the list of those dealing with injuries in 2019. In last week’s Tuesday Takeaways, we informed you of Daniel Cope‘s broken finger (more on that in the next section), Trevor Cadd redshirting and will miss the entire 2019 season and Jackson Lyon dealing with a back issue. Now add right-hander Dillon Brown and infielder Zach Lew to the already crowded training room. Brown appeared to injure his right hamstring while pitching in relief against University of San Diego last Tuesday. Brown stumbled off the mound awkwardly during a pitch delivery and appeared to tweak something on the back of his leg. Coaches and trainers came out to attend to Brown and he even attempted to see if he could continue. Each time he lifted his left leg to deliver a pitch, Brown stopped and walked off the mound. He tried this twice and did not even throw a ball while trying to work out the pain. Brown’s face was all-telling in that there was too much pain and he would not be able to generate any power off his right leg. He was relieved by Gavin Velasquez who was given as much time on the mound to warm up due to Brown’s unexpected injury. The good news is that Brown was seen throwing in the bullpen at Long Beach on Sunday. Whether that was to see how he was feeling and rehabbing or Brown was healthy enough to pitch vs. Long Beach is unknown. Brown did not pitch in relief at Long Beach and it is a mystery if he will be ready tonight to relieve against Pepperdine or this weekend against UCSB. Speaking of hamstrings, it appears that freshman sensation Zach Lew may be dealing with a bit of a leg issue as well. In the seventh inning on Saturday, Lew singled and appeared to pull up lame grabbing the back of his leg after reaching first base safely. Lew attempted to walk it off but was eventually lifted in favor of Brett Borgogno. Borgogno played the remainder of the game on Saturday and started Sunday at third base. Borgogno started the season out in Arizona at third base but Lew was making a charge to take over the starting third base spot with a hot bat. In 18 games, Borgogno is hitting .211 while Lew in 15 games has been hitting .286. The extent of the injury is unclear and how long Lew will be sidelined is also unclear. Daniel Cope showing off his index finger he broke during the JMU series. After breaking his right index finger on Saturday night vs. James Madison, Daniel Cope picked up a bat to pinch hit on Sunday vs. Long Beach. 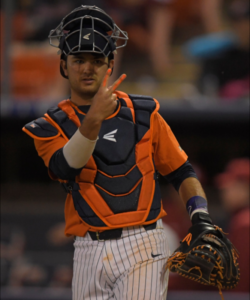 While Cope is on the mend, Kameron Guangorena has been filling in nicely behind the plate. Once Cope’s finger is healed and he can grip a ball and throw out base stealers, expect him to be back behind the plate. That could be an additional three more weeks, possibly for the Hawaii or UC Irvine series. The splint on his index finger was quite noticeable when batting. Although Cope pinch hit for Jairus Richards in the DH spot and popped out, it was good to see him with a bat in his hand so quickly. The main goal for any college baseball team is to win the conference no matter how highly regarded the team is during the preseason. Win the conference and you are guaranteed in the postseason. From there, anything goes. With that said, the Titans have a great opportunity in front of them to improve their RPI numbers in just one week… all while playing at home. Tonight the Titans welcome in Pepperdine. The Waves have a 12-8 record and an RPI of 21. This weekend, UC Santa Barbara comes calling with 17-3 record and a 9 RPI. Titans currently sit with a 62 RPI which is well below the threshold a team must have in the RPI rankings in order to get an at-large postseason invite. Of course the playoffs are not starting today but this gives a baseline as to the trajectory of the team pertaining to their postseason hopes. The RPI takes into account opponents win/loss record, location where the games were played, and considers if the team RPI is top 25, 26-50, 51-100, 101-200 or 200+. Prior to the Pepperdine game, the Titans are 11-10 and only have one win vs. a top 25 RPI team (Stanford). This weekend’s series vs. UC Santa Barbara is huge for two reasons. Not only does it start the Big West Conference season but the Gauchos have a top 10 RPI. A clean sweep could improve the Titans RPI tremendously. The Gauchos are 17-3 and have gone 15-1 after going 2-2 to open the season. 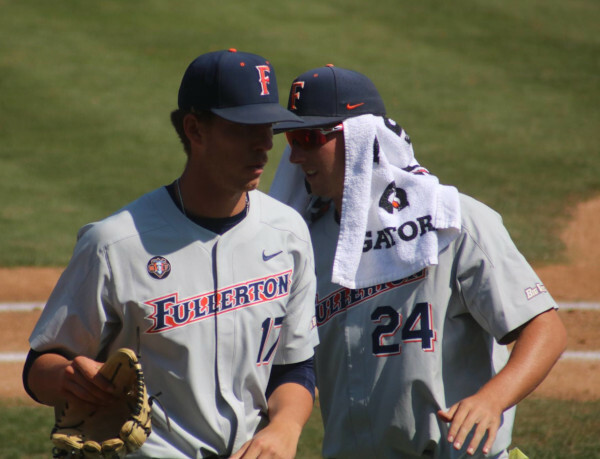 Michael Knorr (L) gets advice from Friday night starter Tanner Bibee (R) upon entering the dugout after a 1-2-3 inning vs. Long Beach State. In the nick of time, it looks as though the Titans starting rotation has settled down and will be Tanner Bibee Fridays, Kyle Luckham on Saturdays and Michael Knorr on Sundays. With those three on the mound the past two weekends, the performance has been exceptional. The last six weekend games have seen the starters combine for 42 innings pitched, seven total runs, five of them earned with a combined 1.10 ERA. The importance of the next set of games upcoming this week was already touched on. The Titans can really put themselves in a great position heading into Big West play or really dig themselves a hole. It could be a stark indicator of how the remainder of the season will commence.